Hatton Musical Theatre Society, (formerly Hatton Operatic Society), has its origins in a street party in Bedfont, Middlesex to celebrate VJ Day in 1945. By the time the group celebrated its 50th anniversary in 1995, over 80 productions had been staged, mainly in the Feltham area but also as far afield as Slough and Bracknell. 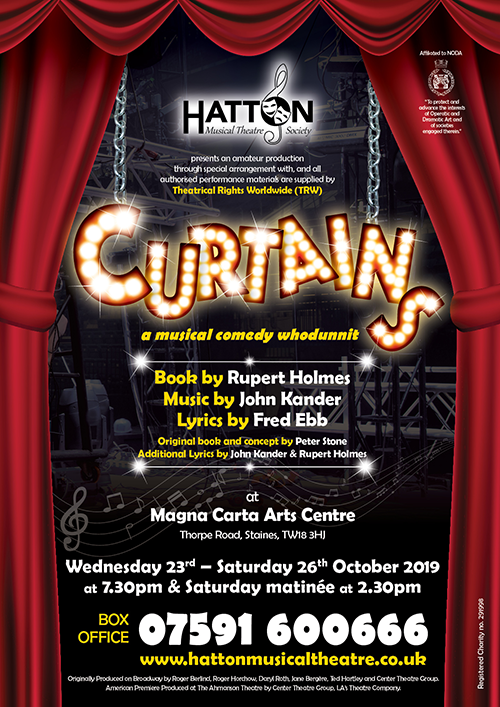 Hatton made their debut at Magna Carta Arts Centre with a production of Salad Days in 1999. (The brief period staging shows elsewhere had the luxury of a big venue, fully equipped, but not the regular audience following.) It was followed by the first of the more unusually staged shows that have come to be a trademark – The Gilbert & Sullivan Story in 2000. In 2001 they achieved a sell-out run of Oliver! still fondly remembered for a soppy Bullseye – (the lovely dog was so completely opposite in temperament to the character she played) and the superb performances of many of the home-grown principals. In 2004 a re-visiting of The Matchgirls also showed off the talent within the society and started an association with the Magna Carta Arts Community Manager, who directed the show, an association that continues to this day. Society roots in operetta and G&S have not been forgotten. In 2005 Hatton celebrated their 60 years with a performance of The Merry Widow (updated to the present day) and two Australian versions of G&S have also been brought to the stage. The Mikado, complete with a 11ft red wardrobe and Chinese-style Ming jars big enough for a man to hide in, was staged in 2006. This was followed by HMS Pinafore in 2009, a very energetic performance with dancing male and female sailors, although you couldn’t tell which was which- (even mothers didn’t recognise their children). 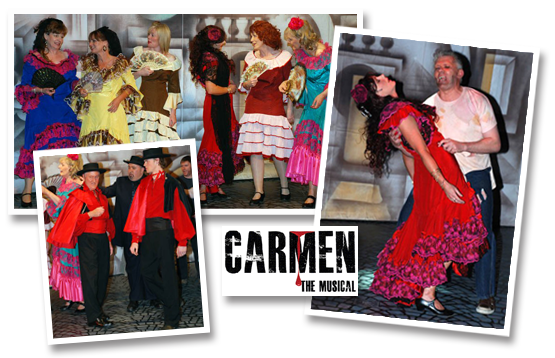 The most recent operatic show tackled was the vocally demanding Carmen the Musical in 2010. The 60th anniversary year – 2005 – also saw retirement (from the stage) of one of Hatton’s longest standing members, Elizabeth Connor, who had also acted as Society Treasurer since 1966. She and her husband John were very much the matriarch and patriarch, having steered the Society for much of the last 30 years. Between them they had clocked up over 105 years of association. Elizabeth has now been made our Society President and she remains very active within the society today- you will find her manning the theatre box office at our performances and occasionally treading the boards with us for a guest appearance! We have also seen the semi-retirement of Rachel Keegan, our long standing rehearsal pianist and sometimes MD, who has been playing for us since 1972. Her attention to detail and talent for teaching the music – particularly the chorus singing that has always been of a phenomenally high standard – are sorely missed. In 2008 the society staged Jane Eyre to sell out audiences. This was a modern musical setting of the story, written by John Caird (who wrote the book for Les Miserables). This stunning production, again conceived and directed by the Theatre Community Manager, brought together the many talents of all the members of the society,both on and off stage.This production won the National Operatic and Dramatic (NODA) award of Excellence. A further NODA Accolade of Excellence was awarded for their stunning production of Annie in 2012. Technically the Group are fortunate in having the ability to design and build their own sets and special effects. Plants that grow and muffins that rise when taken out of the oven for Calamity Jane; a suspended, lit bar sign (Anything Goes); an attic that collapsed (noisily) during the fire scene in Jane Eyre; a ships aft complete with upper level bridge, a mast and rigging for HMS Pinafore; and a secret door, sash windows that went up and down and the remarkable fully revolving Hotel entrance for Thoroughly Modern Millie have been among the achievements. We even managed moving trees and an electronic hen for our 2014 production of Into The Woods which won the production team, cast and crew a NODA Award for Excellence. Our 2015 production of The Boy Friend achieved some record ticket sales and provided many of our talented younger members the chance to shine. This too won the production team, cast and crew yet another NODA Accolade of Excellence! Our 2016 production of The Secret Garden and 2017 production of Oklahoma! drew many accolades for their fantastic set design- these shows are yet another example of how as a society we continue to challenge ourselves. In 2009 the group took the decision to stage two performances a year – a ‘Book’ musical in Autumn and a ‘compilation’ show in Spring. The compilation shows are designed to encourage and nurture talent and give everyone a chance to perform. They also allow our audiences to see and hear musical numbers from both classic and more contemporary shows that might not otherwise come to the Magna stage. To date, Rodgers and Hammerstein and the MGM musicals have been showcased as well as an Olde Tyme Music Hall, Keep the Home Fires Burning– (a Centenary of WW1), a compilation of songs from West End productions and, more recently, our Hatton Celebrates 70 Showcase,which was performed as part of our 70th birthday celebrations. Give My Regards To Broadway and our 2017 Jet Set saw an influx in younger members and new talent; two of our ‘Teens’ have now moved on to take up professional training at prestigious Performing Arts Schools. We hope to welcome them back in the future as directors/choreographers. So – that’s Hatton! Our most recent book show was Crazy for You where we played to sell out audiences once again, and we have just finished performing our March compilation show, Back to Reality, songs from musicals inspired by real stories. The need to plan means we know well in advance when our next shows will be and what they are. 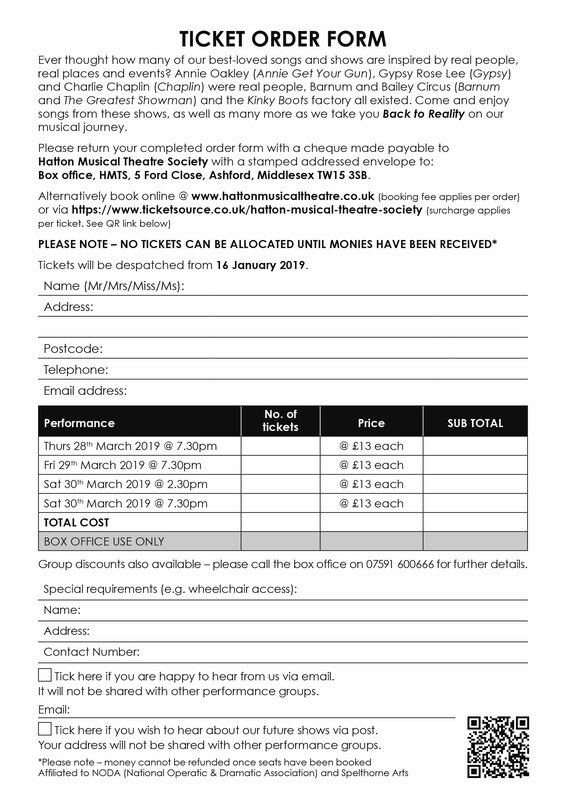 Please see our Future Productions page for details of our thrilling forthcoming book show productions: Curtains, Jekyll and Hyde and Made in Dagenham. Click here to be added to the mailing list or here if you want to come and meet us at a rehearsal. We hope to see you soon.